Evocative of traditional Spanish ironwork, the Bocage Collection by Lakeview Outdoor Designs adds sophistication to any outdoor seating area. Transform your outdoor seating area into a tranquil retreat with this chaise lounge. With 5 back positions to choose from, you will be able to sit in comfort for hours on end. The frame is hand-finished in Burnished Amber and sealed with a clear topcoat to protect and prolong the life of the furniture. The included 4 1/2 inch thick cushions are poly-wrapped foam and covered with industry-leading Sunbrella fabric that resists mold, mildew, and fading. Adjustable leveling feet allow ideal placement, providing improved stability on uneven outdoor surfaces. Dimensions (in inches): 29 1/8 W X 78 3/4 D X 39 3/4 H. Included assembly hardware is made with stainless steel components for outdoor use. The Bocage Collection features scroll designs reminiscent of Spanish ironwork found in the French Quarter of New Orleans. The Bocage Collection exudes elegance and is guaranteed to make a statement in any outdoor space. The Burnished Amber frame is hand-finished and sealed with a clear topcoat to protect and prolong the life of the furniture. The included 5 1/2-inch-thick cushions are poly-wrapped foam and covered with industry-leading Sunbrella fabric that resists mold, mildew, and fading. The cushions in all sets are a neutral Heather Beige color that accents the Burnished Amber finish. Instead of using a traditional Textilene fabric, the seat and seatback of the Bocage dining chairs and chaise lounges are made with a Sunbrella sling that makes the chair comfortable with or without the included seat cushion. The use of Sunbrella fabrics guarantees that your sling and cushion fabric will last, as they are designed to withstand the elements. Special design elements of the dining chair include detailed legs and chair arms. The scrollwork on the chair back is a beautiful work of art that ties the dining chair design to the table design. The Bocage dining tables are stylish with features such as a basket-weave tabletop with gracefully curved legs and are available in 48 inch round, 84 X 42 inch oval and a generous 102 X 47 inch rectangle for seating up to 8 guests. Adjustable leveling feet allow ideal placement, providing improved stability on uneven outdoor surfaces. 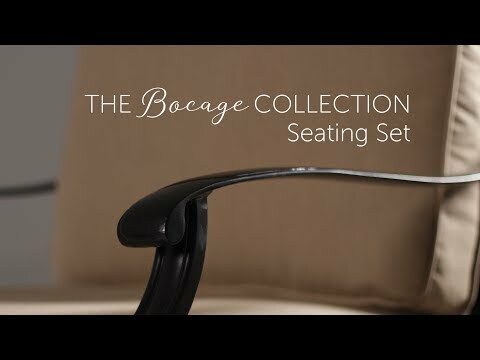 The Bocage Collection also offers a variety of deep seating sets, all with the same Burnished Amber finished cast aluminum frame and Heather Beige Sunbrella cushions as the dining sets. The large club chairs are designed for comfort and feature cast aluminum scrollwork on the back. Seating sets in this collection offer standard club chairs, swivel rocker club chairs, loveseats, and sofas. There are a variety of tables that can be used with the seating pieces, including a 21-inch side table, a 42 X 21 inch rectangle coffee table, a 42-inch round coffee table, and a 48-inch round fire pit table that is perfect match for the club chairs. The ultimate source of relaxation can be found with the 5-piece conversation set with a fire pit table and four comfortable club chairs. Unwind in the flickering fire light of the fire pit table, featuring an intricately weaved top. A built-in control valve operates the 55,000 BTU stainless steel burner, allowing you to manually ignite the fire pit as well as control the flame height. This collection also offers chaise lounges which can be used to soak up the sun in any outdoor space. Only the dining chairs and chaise lounges are available with a sling seat and back; this collection does not offer patio bar furniture or sectional sets. 11 13/16" 12" 11 13/16" 11 13/16"
20 7/8" 19" 20 7/8" 20 7/8"